Rivet Power Tool - 1/2-13 Pull to Stroke - 18,000 lbs. Rivet Power Tool - 1/2-20 Pull to Stroke - 18,000 lbs. Rivet Power Tool - 3/4-10 Pull to Stroke - 18,000 lbs. Rivet Power Tool - 3/8-16 Pull to Stroke - 18,000 lbs. Rivet Power Tool - 3/8-24 Pull to Stroke - 18,000 lbs. Rivet Power Tool - 5/16-18 Pull to Stroke - 18,000 lbs. Rivet Power Tool - 5/16-24 Pull to Stroke - 18,000 lbs. Rivet Power Tool - 5/8-11 Pull to Stroke - 18,000 lbs. Rivet Power Tool - M10 Pull to Stroke - 18,000 lbs. 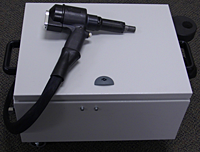 Rivet Power Tool - M12 Pull to Stroke - 18,000 lbs.